4-05: Tartar Dynasties: Jin Dynasty (1115 � 1234 AD). King Hai Ling, also called Emperor Wan Yan Liang (1149 � 1161 AD). 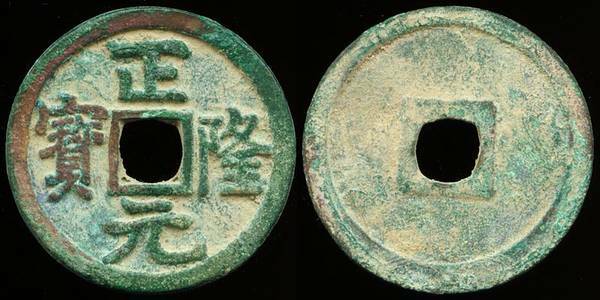 Obverse: �Zheng Long yuan bao�, clock-wise with regular 4 stroke �Zheng� (as opposed to the 5 stroke variety, scarce). Cast between 1158 � 1161 AD. Hartill # 18.40; FD1637, S1083.